3 climate zones, 8 time zones, 12 tonns of fuel, 180 flight hours - these figures represent the helicopter expedition "Russian 360". The expedition’s unique route will take place along the borders of the Russian mainland. 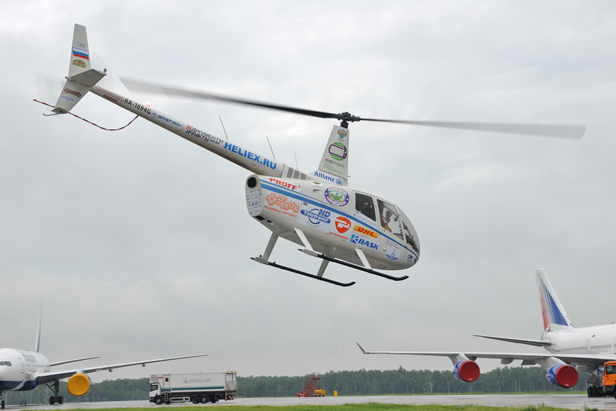 Pilot Igor Gurzhuenko shares with RBTH news of the Russia 360 helicopter expedition. Night smoothly shifted into the morning. On the night before the flight, I had planned to update the devices aeronautical database and add the flight plan. On the first day, we were scheduled to have five flights. 1. From the heliport Bunkovo, ​​where the helicopter is based, to Domodedovo Airport, where it was scheduled for the official start of the expedition. 2. From Domodedovo back to Bunkovo, ​​to refuel before the first flight. 3. From Bunkovo ​to Pskov, where another refueling is planned. 4. From Pskov Airport to the westernmost part of Russia. 5. From this point to the Helidrive heliport in St. Petersburg. That’s the task for one day! I managed to sleep mere hours. When the alarm clock rang, my head was blunt. Ten minutes after the take-off to Domodedovo, it became clear that it was still raining in Moscow. On the way to the airport: low clouds, rain, misty thermals rising from the forest. We had to slow down and almost crawl our way to the waiting area fence of Domodedovo Airport. From the helipad H5, we picked up the machine, and here we are—going through an outlet for VIPs. Finally, were once again on the helipad. We’d have liked to take-off ASAP, but there were some problems in the Domodedovo ADP and we had to wait about half an hour, already sitting in the cockpit. Bunkovo ​is ​only 37 miles away from Moscow. In Bunkovo, ​​we fueled and loaded back our numerous belongings. For the second time, we had cut our own packed meals—emergency food rations—leaving only four sets for two days. In the end, we had a gun and fishing tackle, so that we could survive a few days without food, if that happened. … But the main problem for us was waiting for the flight plans, which are verified by the air traffic services. My plan, filed and approved in advance, somehow was canceled, and I had to submit a new one. In theory, the plans are submitted one hour in advance, but here we had a flight to the next control area (St. Petersburg). In reality, this takes longer than it does when the flight is carried out within a single zone. The airport in Pskov closes at 6:00 p.m. Provincial airports do not work around the clock, and some are not even in operation for the full week. It’s already 1 p.m. … 2 p.m. … I felt that, just a little more, and we shall not get anywhere today. Luckily, the current rules allow flights to fly out of the control zones of the airports upon the notification procedures with minimum formalities. I made the following decision: to take off without any plan, upon notification, and when our headquarters oversees the approval of the flight plan and will be in touch with the services of the ATM. We took off. Flying for one hour—the plan was not approved. Flying for two hours—still the same. Some delays and endless torques. Moscow refers to St. Petersburg, St. Petersburg to Moscow. Ridiculous situation: The start of the famous expedition immediately sinks into incomprehensible delays, without any reasonable explanation. Finally, when we were already on approach to Pskov and under their control, our headquarters called—the plan is approved! We arrived in Pskov at 5:30 p.m. Cheers! We made it before they closed! I ran to pay for the airport taxes and fuel. Imagine my surprise, when the bill was listed for the fuel, plus another 20,000 rubles [$600] for the … operation of the airport outside of regulation [hours]. That’s how it is! We hurried up, and we even managed to fill up before 6 p.m., but the time the airport spent issuing bills at the cash desk forced them to continue to work after hours—and I was forced to pay a bill for an extra hour of the entire airport. But here, all the excitement was behind us and we were going in the direction of the first point of the route: to the westernmost point of mainland Russia. It is located near the Lavry village monastery, in the Pskov region. This is not a special place, and it is not labeled either on the map or on the ground. We flew up to the border, reset speed, and set all our navigators to the maximum resolution mode. In the air there are no boundaries, and one can unconsciously become a border violator. Besides, we needed not only a clearing in the woods, but one closest to the border point, at the characteristic bend of the state border, which was chosen because it juts out westernmost, towards Estonia. We had to find this spot: We tried for 20 minutes, looked at all the maps and on the ground, looking for where to land. We saw the striped border posts from the air, but we could not identify them as Estonian or Russian. There was no classical control-border strip; there was only a clearing in the forest and a small river, Pededze, along which the border between Russia and Estonia is set. Finally, we found the right spot! It was a dirt path along Pededze, just 50 meters [165 feet] away from the border. We landed, turned off the engine. Whew, we can have a break. We had to fly at the full load: The helicopter is stuffed with things, plus fully fueled. And the temperature was very high today, 28 degrees Celsius [82 degrees Fahrenheit]. We had to be as careful with the speed, wind and maneuvers as possible. We took a few plans for the camcorder and wrote a little synchronicity. Then, we fastened our symbol to the plate—a memorial with the logo of the expedition. We turned our panoramic head and shot spherical panoramas. It’s time to head further. There are only two of us, and we have to fly, and solve problems, and do the navigation work, all at the same time. We’re heading to St. Petersburg. And here the exhaustion began to push so hard that I was falling asleep right in the flight. As they say—do whatever you can! But the helicopter does not forgive mistakes! We kept on changing, piloting in turns. It’s 1 hour and 40 minutes until our destination: It did not seem far away, but the body is no longer in control and is ready to fall asleep in a second. We are close to Pulkovo, standing in the south waiting area to be permitted onto the landing passengers boards. Suddenly, the managing tower asked: Aren’t we the “Russia 360″ expedition? Of course, we are! We landed. Our first thought was how to call a taxi. … Just imagine our surprise (pleasant, of course) when we saw that the Helidrive car was waiting for us, to take us to the hotel. Just a little symbol of hospitality—but so warm and friendly! We literally fell out of the helicopter from fatigue, and our thoughts were only about how to eat something hot and be forgotten in a dream. P.S. The result of the day—1,230 kilometers [764 miles] in 6:41 flight hours.